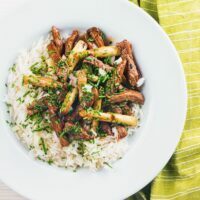 Beef with oyster sauce is an ever-green takeaway favourite, my fakeaway version is ready in just 20 minutes and features wonderful white asparagus! 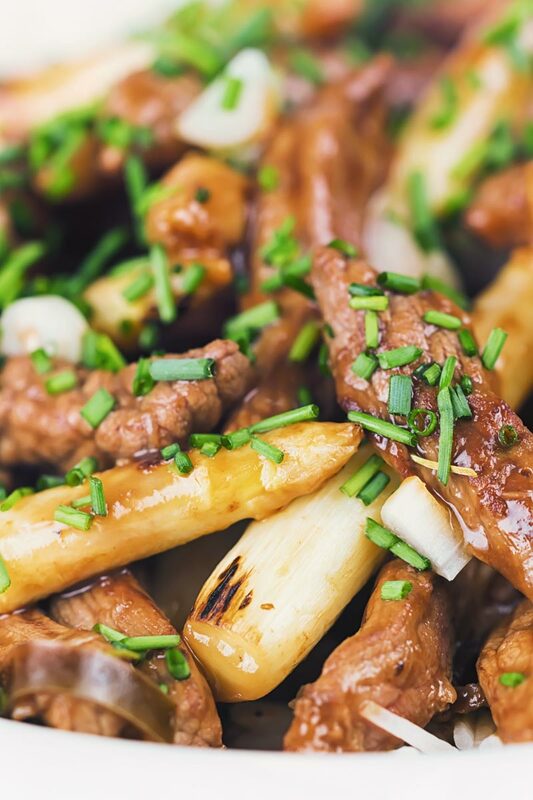 Beef With Oyster Sauce and White Asparagus. 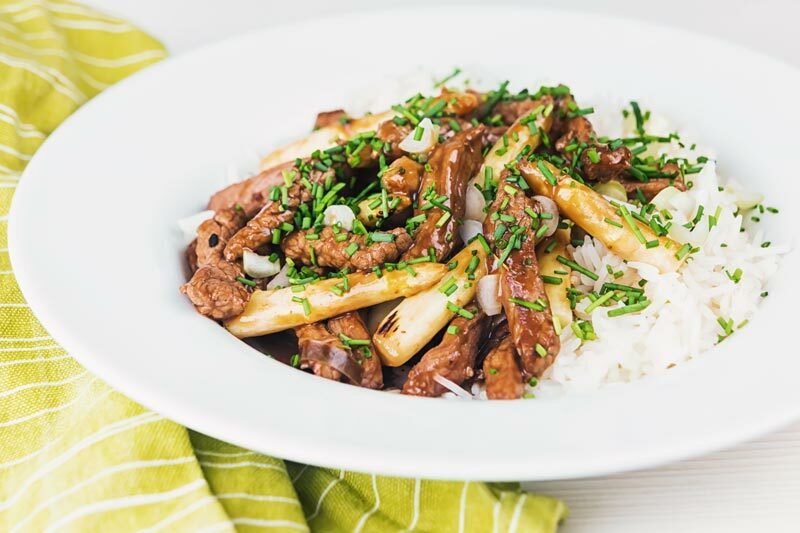 A Beef with oyster sauce dish is an ever-present recipe on your average Chinese Takeaway menu… Super simple, extremely tasty and goes from your cupboard to your dinner table in just 20 minutes. Way quicker than the delivery dude or dudette can get to you. For me, all of the ingredients that go into this stir fried beef with oyster sauce recipe are store cupboard essentials. 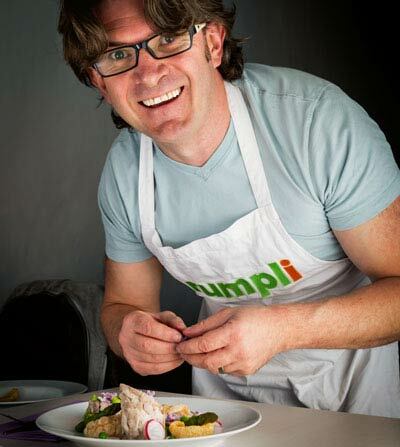 Admittedly my obsession with fakeaway recipes is partly driven by the lack of international food where I live. But whether it is Chinese, Indian or Thai food having a well stock pantry is the key to cooking these types of recipes. Whether it is my General Tso’s Chicken, Chicken Lo Mein or my Black Bean Chicken Stir Fry they all have a foundation of similar ingredients. For Chinese food, those core ingredients begin with Soy Sauce, Rice Wine, Chinese Vinegar and Sesame Oil. 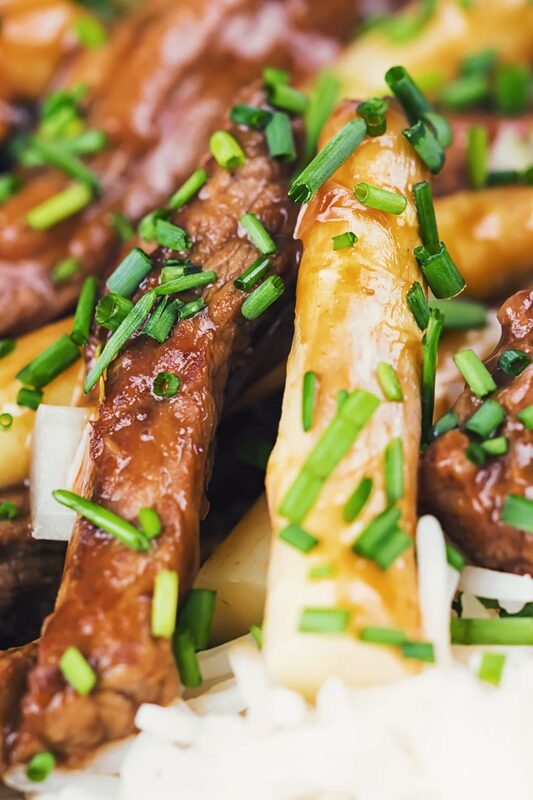 Bolt on garlic, ginger and sauces like black bean sauce or oyster sauce and you have a whole world of fast tasty food at your fingers. 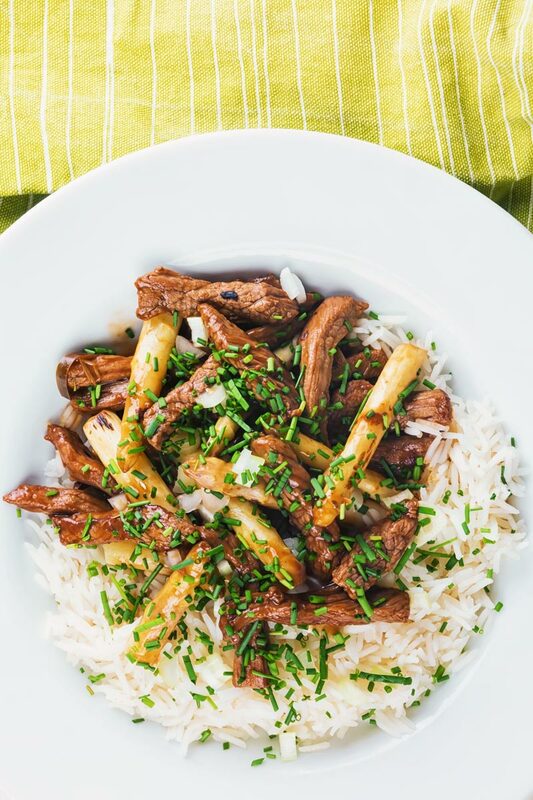 This beef with oyster sauce stir fry comes bundled with white asparagus. But what is white asparagus other than… well, asparagus? White asparagus is incredibly popular in Europe and it is essentially regular asparagus that has been grown underground or without light. Growers will soil-up the asparagus spears when they appear from the ground or cover them and keep on growing. The lack of sunlight inhibits the production of chlorophyll meaning that the spears do not go green. White asparagus is milder in flavour than green asparagus but also a little sweeter. It is typically cooked on much longer than green asparagus as the texture is not as soft as green asparagus. In this beef with oyster sauce recipe though I have kept the cooking time short. 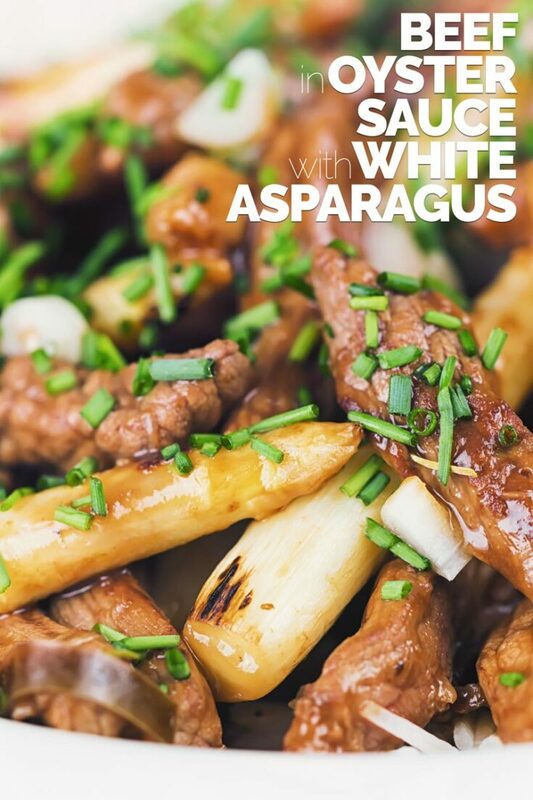 This leaves the white asparagus with a texture relatively similar to water chestnuts, a perfect contrast to the soft beef in this recipe! The Secret To Stir Frying. It does not matter whether it is this recipe, my beef and broccoli stir fry or my Szechuan shrimp stir fry they all have one key secret. That secret may come as a surprise, many say heat, many say oil… Sure they are important but if you are not prepared then both of those are irrelevant. When stir frying food preparation is singularly the most important part of the recipe. More than any other style of cooking you have no time to chop something or to mix sauces. If we look at this recipe, we cook for 30 seconds. Then we add ingredients, cook for two minutes. Then we add more stuff and another two minutes. All the time we need to keep the food moving in the pan. Seriously there is no time at all for ingredient prep. So when you are planning a stir fried meal, prepare everything… Absolutely everything before you even put your wok on the stove. You will not be disappointed! 1 Tbsp Cornflower, AKA Cornstarch in the US. Cut your steak into strips 5mm in profile and around 5cm long. Mix together the sesame oil, soy sauces and Shaoxing wine with the cornflower and pour over the beef. Allow to sit for 5 minutes whilst you prepare the vegetables. Cut your chili into fine strips, your ginger into batons and finely slice your garlic. Heat a wok over a fierce heat, when shimmering add the oil followed by the chili garlic and ginger and stir-fry for 30 seconds. Throw in the asparagus and stir-fry for another 2 minutes. Remove the beef from the marinade throw that in and again fry for 2 more minutes. Finally mix together the oyster sauce with the marinade and pour into the wok and stir until a sauce is formed. Serve over rice and sprinkle with the spring onions and snipped chives. I’m totally with you on the preparation. Stir frying moves so fast you have got to be ready! I love anything with oyster sauce, it has such a delicious flavor. Great recipe! Oh that looks delicious. Now you have me adding things to my shopping list to make this soon. Really love the combination of beef, white asparagus and oyster sauce, what a nice set of core ingredients. Looks really delicious. I love white asparagus, and was first introduced to in when I was living in Spain. I think it’s fascinating how it grows underground. Looks fabulous in this tasty meal! It seems such a common combination I am surprised you have not stumbled on it before… Oysters and beef have such a crossover in many food cultures, oysters in beef pie are a huge one that spring to mind.